SSC JE Result 2016 had been announced now. 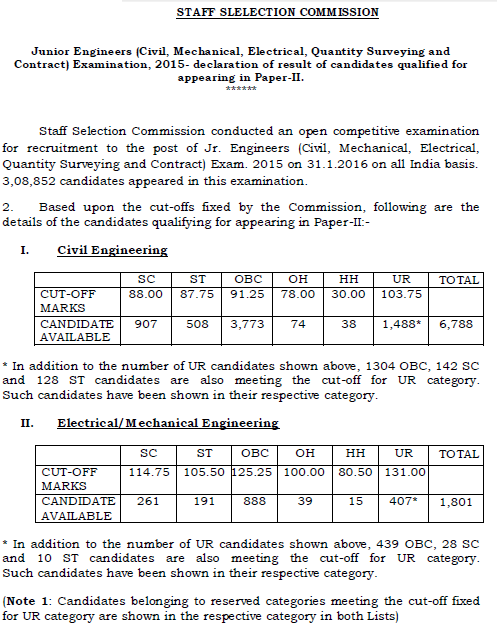 Those who had given the written examination for Junior Engineer (Civil, Electrical, Mechanical) held on 31 January 2016 can now check their qualifying status. Staff Selection Commission had released the cut off marks and merit list (list of candidates qualified for Paper 2). Here you can check SSC JE Exam Result using direct links. SSC JE marks had also been announced now. Check from below. 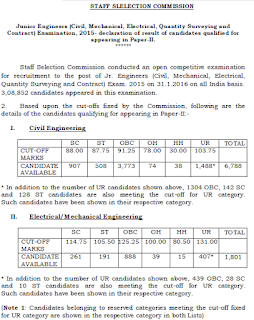 Staff Selection Commission had organized Junior Engineer 2015 paper 1 examination on 31.01.2016. It was an open competitive examination for recruitment to the post of Jr. Engineers (Civil, Mechanical, Electrical, Quantity Surveying and Contract) Exam. 2015 on 31.1.2016 on all India basis. A total of 308852 candidates appeared in this examination. Out of these, only 8589 candidates were able to qualify for paper 2. Among these 8589 candidates, 6788 are from Civil Engineering and 1801 are from Electrical and Mechanical engineering. Staff Selection Commission had declared the marks obtained by the candidates in Paper 1, on 06 May 2016. Along with the scores of Paper 1, SSC will also upload the OMR sheet and final answer keys used to determine candidate's marks. Each candidate can know their marks obtained from here from 06 May 2016. Staff Selection Commission had also released the cut off marks used to shortlist candidates. Here are the official cut off marks for Civil, Electrical and Mech. SSC had also announced the date of Paper 2 examination which will be held only for those who managed to clear paper 1 exam held on 31.01.2016. Their name and roll number had been mentioned in the result pdf. SSC JE Paper 2 examination will be held on 24 July 2016. SSC JE Paper 2 Admit card: Qualified eligible candidates who do not receive the Admission Card for the Paper-II Examination at least 7 days before the start of exam or are unable to download from respective Regional Office website should immediately contact the respective SSC Regional Office of the Commission.